If you own a small business, the last thing you want is to be exactly like everyone else. You need your business to stand out, and you need your audience to believe that you’re the best option for them. You need to be known for something. There’s even a name for this: it’s called a USP (or unique selling proposition), and it’s Marketing 101. It’s not a new concept, but it is one that many business owners fail to grasp. Instead of celebrating their quirks and individualities, they worry about how they stack up to the competition. Newsflash: it doesn’t matter how well you stack up to everyone else! Don’t compare yourself to others in your market. Don’t worry about not having the same skills/contacts/technologies as your competitors – that’s not what makes you sellable. You have your own unique strengths, your own personality, your own you-ness. That’s why people will want to work with you. 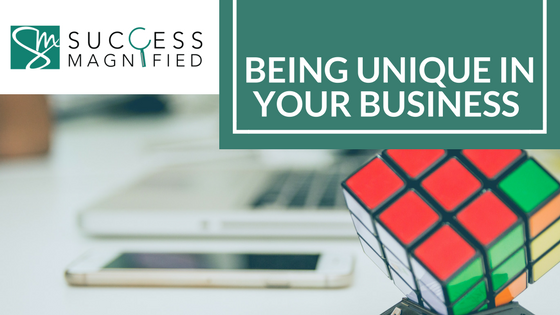 Understanding how you are unique – and totally different from everyone else – is your most valuable asset. It doesn’t matter if John has had more training than you, or if Jennifer pays for some fancy software you can’t afford. People will pay for the added value of having a relationship with you. What unique skills do I have? Is there something I do better than everyone else I know? What tasks do I truly enjoy doing? Is there something that my clients, friends, or family are always telling me I’m great at? Sometimes people go into business not quite knowing what their niche is, and that’s ok. If you’d like help figuring out your own little spot in the world, my Pinnacle Gift Course can help you move away from the competition into being truly unique. Entrepreneurs achieve significantly higher levels of success when they are crystal clear about why they are on the planet, and they ensure that their Pinnacle Gift™ is the foundation upon which their entire business is built. You can find out more about my Pinnacle Gift™ Course here.